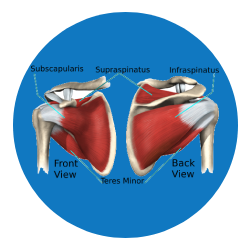 Rotator cuff tears are the most common injuries of the shoulder. Rotator cuff is a group of tendons that attaches forearm bone to the shoulder bone and aid in lifting and rotating the arm. Tear in the rotator cuff cause pain and disability in adults. Rotator cuff tears are caused by injury and degeneration. Falling down on your outstretched arm or lifting something too heavy with a jerking motion, can tear your rotator cuff. Other types of tears are the result of wearing down of the tendon that occurs gradually over time or with ageing. With a degenerative tear in one shoulder, the likelihood of a rotator cuff tear in the opposite shoulder is greater. Repetitive stress: Repeating the same shoulder motions again and again can stress your rotator cuff muscles and tendons. Sports activities and routine chores can also cause overuse tears. Lack of blood supply: With age, the blood supply to our rotator cuff tendons is reduced. This can ultimately lead to a tendon tear. Bone spurs: These are overgrowth of the bone that often develop, and hurts with lifting of our arms, when the spurs rub on the rotator cuff tendon. Over time, it will weaken the tendon increasing the tendency to tear. Weakness when lifting or rotating arms.